Jenny B. Jones has been my go-to writer for YA. I love her writing style and wit. Every one of her book contains gut-busting funny scenes and characters. 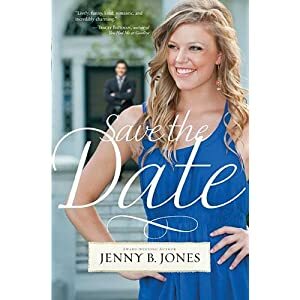 I was excited about reading her latest book, Save the Date, since it is was not a YA book. Although I love Jones style, I finished the book feeling torn. I had a love-hate reaction to so many things in the book. For instance, the characters were great. I loved Lucy’s weird group of friends. They were hilarious. I loved Lucy and Alex. They were engaging and I actually cared about what happened to them. But I didn’t like Lucy and Alex’s interactions. They were constantly snipping at each other, to the point that it was hard to believe that they fell in love. Also, their dialog was snappy and witty, but it didn’t seem like they were saying anything of substance to each other. I like the premise of the book: a contract marriage, but, I didn’t like that both Alex and Lucy were Christians and they were completely okay with lying. I understand that Christians are imperfect and they lie, but it was hard to sympathize with their plot. I also didn’t like the fact that there were no real consequences for their lies. If this was not a Christian fiction book, the “means justify the ends” attitude that Lucy had might not have bothered me that much. But because Lucy was a Christian, it disturbed me how easy it was for her to continue to lie and that she never had to suffer any consequences for lying to so many people. Another love-hate issue was the character named Julian. I loved the risk that Jones made including such an effeminate man in her story. Unfortunately, he came across very cliché gay. I would love to know if that was the author’s intention. Despite that, Julian was one of the funniest characters in the book. I really don’t know how to rate this book. The writing was solid and the setting was plausible. However, the characters and plot, namely the ending of the novel, caused me to lower my score for this book. Now, because I’ve been a loyal follower of Jones’ writing, I will buy her next book. I also would encourage others to read this book despite my review. It is definitely a book readers need to form their own opinion about.